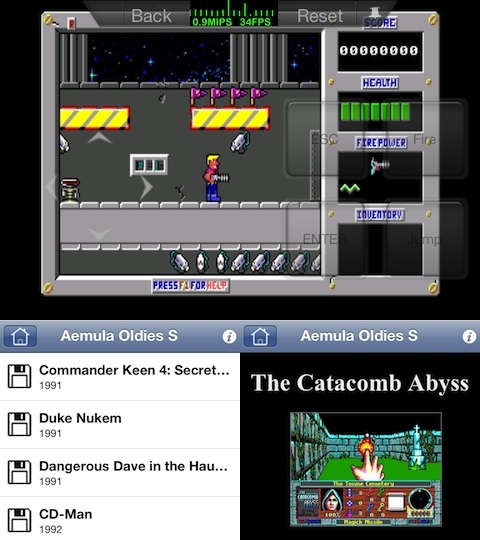 Aemula Oldies S is a new iPhone application that will appeal to retro x86 DOS gamers or anyone curious to see how old timers used to get their kicks. The game is basically an emulator which offers many classics such as Commander Keen 4, Duke Nukem, Bio Menace, Prince of Persia, and more. The main menu is simple, clean, and reminiscent of classic DOS emulators that you could download for your PC such as DOSBox. To select a game, you simply browse the menu and tap the title. The games have their publish year listed, some dating back all the way to 1991, which is a nice bit of info. The graphics, menus, levels, bosses, and characters are all exactly the same as the original games. Note: You should download this app soon because other emulators have not lasted very long in the App Store. Recently iMAME was added and yanked out of the App Store by Apple in a couple of days, and previously iDOS suffered the same fate. Aemula’s controls are easy and user friendly although playing can take some time getting used to on the small iPhone screen. You have several options for controls. The default controls are a game pad. This pad includes 4 directional arrows and several labeled buttons including enter, fire, jump, and escape. This is an easy way to play, although I would have liked the fire and jump buttons to be next to each other horizontally rather than on top of each other. Enter and escape are buttons that I did not use as often as jump and fire, so they should be placed at the top while the most common buttons should be closer to the user’s thumb at the bottom. Another control option is the joy stick which can be toggled from the mini-menu above the pad when you begin a level. The joystick still has the buttons, but the arrow pad is replaced with a 8 direction joy stick. I am glad they included this feature because some games are easier to play with a joystick. There is also a keyboard option on the mini-menu. You would only need the keyboard for games that require you to press numbers or letters to advance. There are also simple text buttons to go back to the main menu and reset the game at the very top of the app. They are a little hard to see, but they are easy to use. The best part about Aemula is that you can rotate to landscape view your iPhone or iPod touch and play the game in full mode. 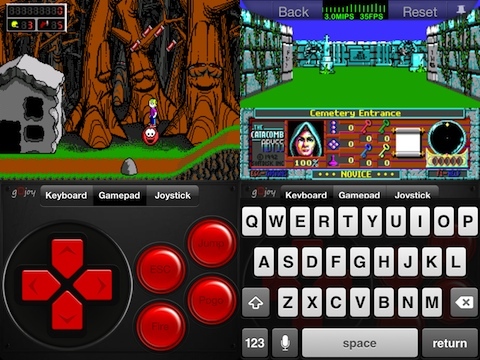 In the landscape mode the controls are placed over the game as semi-transparent buttons and arrows. It will take some time to learn where they are and how the function so be prepared to lose a few games. Each game offers its own classic 8-bit music. It is grainy just like the classics. However, I do not see an option to turn the music off if you are in a quiet environment. Games save their scores and data, and if you scroll to the bottom of each game selection screen, there is an option to reset any saved game data. Aemula Oldies S is a perfect little app for anyone who wants to go back to their retro floppy disc days. There are inline ads when you’re going throughout the game picking menu, which is not too bad to deal with. Overall I’m really happy that there is finally a DOS emulator in the App Store. Best of all, it’s a free download. AppSafari review of Aemula Oldies S was written by Joe Seifi on December 25th, 2011 and categorized under Adventure, App Store, Featured, Free, Games. Page viewed 4514 times, 1 so far today. Need help on using these apps? Please read the Help Page.